"What Do You Know About Love?" Since the film's release in November 2013, the franchise has expanded very rapidly. To date, the franchise includes various Disney theme park attractions, merchandise, video games, books, a Disney on Ice show, a Broadway stage musical and two short animated films. Disney has also confirmed an animated film sequel, and a new book series. In November 2014, TheStreet.com explained that "Frozen is no longer a movie, it's a global brand, a larger than life franchise built around products, theme parks and sequels that could last into the next century". Boxoffice chief analyst Phil Contrino was quoted as saying "it's become massive". Frozen was released in 2013 and was based on the Hans Christian Andersen fairy tale "The Snow Queen". The film earned two Academy Awards in 2014 (best animated feature and original song) and took in $1.2 billion globally and sold 4.1 million soundtracks by June 2016. On March 12, 2015, at Disney's annual meeting of shareholders officially announced a full-length sequel was in development at Disney Studios. The Frozen Fever short film was released with Disney's full-length live-action Cinderella in 2015. With the success of the movie, Disney began work on three musical adaptations, for Disney California Adventure, Broadway and Disney Cruise Line, with the first starting in May 2016. In June 2016, Disney announced a franchise extension called Frozen Northern Lights. This brand extension includes animated shorts, books and a TV special. The 2013 animated film Frozen was released to critical acclaim and commercial success, sparking interest in related media to expand the Frozen universe. By June 2014, the film's reliance on Norway for visual inspiration had resulted in a significant increase in tourism in that country, with a 37% increase in tourists from the United States in the first quarter of 2014 (in comparison to the previous year's first quarter). Tour operators (including Adventures by Disney) responded by adding more Norway tours. When asked about future sequels, Del Vecho explained in March that Buck, Lee and he "work very, very well together, so I believe we will be developing a new project. But I don't know what that is right now." In late April, Walt Disney Studios chairman Alan F. Horn said that "we haven't really talked about a sequel" because the studio's current priority is the planned Broadway musical, which will require "four or five" additional songs to be written by Lopez and Anderson-Lopez. When asked in May about a sequel during an interview with CNBC's David Faber, Disney chairman and CEO Bob Iger said that Disney would not "mandate a sequel" or "force storytelling", because to do so would risk creating something not as good as the first film. In the same interview, Iger also expressed the hope that the Frozen franchise "is something that is kind of forever for the company" similar to The Lion King." In June, Lee confirmed that chief creative officer John Lasseter had expressly granted her and Buck the freedom to explore whatever they were "passionate about": "We don't know what it is yet ... We’re actually going to start from scratch. It’ll be something completely brand new." On August 5, 2014, Variety reported that Lee had selected her next project: a screenplay adaptation of Madeleine L'Engle's 1962 novel A Wrinkle in Time, for which Disney already holds the film adaptation rights. However, Lee will continue to participate in Disney Animation's development process (i.e. giving notes on other projects, the same process by which she became involved with Frozen in the first place). On November 28, 2014, in an interview with The Daily Telegraph, when asked about the possibilities of a Frozen sequel and a stage show, Idina Menzel mentioned "they’re all in the works." She also talked about her involvement in these projects: "Ah, yeah sure... Not the stage show – I don’t know what will happen with that – but the movie hopefully. We’ll see. I’m just going along for the ride." However, on December 1, when the subject came up again during an interview on the Today show on the NBC network, Menzel said, "You know, I have no idea. I just assumed that because it’s so successful that’s what they’re up to!" In a March 2015 interview with BuzzFeed about Frozen Fever, the directors addressed and refuted the recurring rumors about a possible feature-length sequel. Buck joked about how whenever they saw such rumors, he and Lee would ask each other, "Are we?" Around the same time, Lasseter reiterated to Variety his philosophy as to sequels (while discussing Toy Story 4): "We do not do any sequel because we want to print money[.] We do it because each of these films was created by a group of filmmakers, and to my mind, they are the owners of that intellectual property. So we look at it with the simple question: Is there another story we can tell in this world? And that desire has to come from the filmmaker group. Sometimes, the answer is an obvious yes. And sometimes it’s, ‘I love the characters and I love the world, but I don’t have an idea yet.’ And sometimes it’s just, ‘that movie is a great movie,’ and the filmmaker wants to move on and do something else. And that’s fine, too." On March 12, 2015, at Disney's annual meeting of shareholders in San Francisco, Iger, Lasseter, and actor Josh Gad (the voice of Olaf) officially announced that Frozen 2 was in development at Disney, with Buck and Lee returning as directors and Del Vecho returning as producer. Lasseter explained that at Disney Animation, "as with Pixar, when we do a sequel, it is because the filmmakers who created the original have created an idea that is so good that it's worthy of these characters." In the case of Frozen, the directors had "come up with a great idea for a sequel and you will be hearing a lot more about it, and we're taking you back to Arendelle." According to the Los Angeles Times, there was "considerable internal debate" at Disney over whether to proceed with a Frozen sequel at Disney Animation, but the unprecedented success of the first film apparently swayed Disney executives towards making a sequel. A month later, Buck disclosed during a visit to Australia that the directors already had an idea for the sequel's ending, but they are still working on the story that will eventually culminate in that ending. He acknowledged their awareness of the challenge they have undertaken: "How do we live up to the phenomenon of the first one? There's a lot of pressure. And we'll put that on ourselves too; we'll be very demanding about how good this one has to be." In November 2015, Del Vecho, while visiting Duke University as the parent of a first-year Duke student, explained in an interview published in the Duke student newspaper that his days are currently divided between two things: "handling the Frozen franchise" and "working up ideas for the development of Frozen 2" with the directors. When asked what to expect from the sequel, Del Vecho stated: "We’re excited by the ideas we have, but it’s too early to talk about them. We wouldn’t be making a sequel if we felt that we didn’t have a story to tell that was equal to or greater than the original." In March 2016, Kristen Bell, the voice of Anna, was asked if she had started recording for the Frozen sequel while doing promotional interviews for The Boss. She replied: "Not yet. We’re just about to. They’ve just written it and they’re still doing tweaks, but I think we should be recording this month. The story is great, and they exude quality .... It took them a while because they wanted to figure out what story they needed to tell and what would be important and engaging and I think they found it." In September, Bell explained in another interview that her earlier comments were mistaken, and she had not yet recorded lines for the sequel because Disney Animation was "still putting the finishing touches on the script," but in the meantime, she had already recorded lines and songs for other Frozen-related projects, like Olaf's Frozen Adventure. In April 2017, it was announced that the sequel is scheduled to be released on November 27, 2019. In August 2017, it was announced that Frozen 2 will be released on Disney+ alongside Toy Story 4 and The Lion King. In March 2018, Anderson-Lopez in an interview about Broadway's Frozen, for which she and her husband wrote the new featured songs, confirmed that they had already recorded a song for the sequel with Bell, the voice of Anna. In July 2018, it was announced that Evan Rachel Wood and Sterling K. Brown had entered talks to join the cast in undisclosed roles. In August 2018, Allison Schroeder, the screenwriter of Hidden Figures and most recently, Disney's Christopher Robin was hired to assist screenwriting duties with Jennifer Lee after Lee assumed the role of chief creative officer of Disney Animation, succeeding Lasseter. On November 1, 2018, Variety reported that Disney advanced five days the premiere of the film, which was initially scheduled for November 27, 2019 and now would be released on November 22 of the same year. The teaser trailer was released on February 13, 2019. A Y indicates an appearance by an actor portraying a younger version of a character. A video game titled Frozen: Olaf's Quest was released on November 19, 2013, for Nintendo DS and Nintendo 3DS. Developed by 1st Playable Productions and published by GameMill Entertainment, it takes place after the events of the film. In the game, Olaf must use his unique snowman abilities in order to stay in one piece throughout 60 levels. Anna and Elsa were released as figurines in the Frozen toy box pack for the toy-based video game Disney Infinity on November 26, 2013, and both figures were released separately on March 11, 2014. Additionally, Disney Mobile released a match-three game titled Frozen: Free Fall for iOS, Android, Windows Phone and PlayStation 4 platforms. It takes place in the kingdom of Arendelle and closely follows the original story of the film, in which players can team up with Anna, Elsa, Kristoff, Hans, Olaf, Pabbie and Sven to match puzzles with the help of each character's special power-ups. Six mini-games can be played on the Disney website. Sony released a limited-edition Frozen-themed PlayStation 4 console in Japan at the time the film was released into the Japanese home video market. In 2014, Frozen was co-branded with another Disney property – children's MMORPG Club Penguin, which became Frozen-themed for a period of time leading up to the Christmas season; the Frozen Party lasted from August 21 to September 3, 2014. In 2015, Frozen Free Fall: Snowball Fight was released on PlayStation 4, PlayStation 3, Xbox One, Xbox 360 and Steam. A world based on Frozen, "Arendelle" appeared in the third main installment of the Disney/Square Enix crossover franchise, Kingdom Hearts. The film played a factor in the fourth season of a television series produced by Disney-owned ABC Studios, Once Upon a Time. On May 11, 2014, the conclusion of the show's third-season finale revealed a new storyline that will incorporate elements from Frozen, centering on the arrival of Elsa, the Snow Queen, after her urn was accidentally thrust into the time-traveling portal from the Enchanted Forest back to present-day Storybrooke. The show's executive producers later explained that Disney had not asked them to do a crossover. Rather, they fell in love with Frozen when it premiered in November, saw it three more times, then developed a story idea in February and successfully pitched it to ABC Studios, the ABC network, and then Disney brand management. The producers shared that "their writers' room was "basically a 'Frozen' appreciation room" and they would be "completely honored" if the original movie stars wanted to reprise their roles. Producer Adam Horowitz said that they were not going to "redo" the film: "We're very aware of what we think makes this character from 'Frozen' so special and we want to honor that and make sure that what we do is in the universe of [what] everyone fell in love with this past year." On June 7, 2014, TVLine reported that Anna and Kristoff would also appear in the show alongside Elsa, casting had begun for all three characters, and that Elsa would appear in approximately nine episodes. By the first week of July, it had been confirmed that the show's producers had cast Georgina Haig as Elsa, Elizabeth Lail as Anna, and Scott Michael Foster as Kristoff. Later on July 22, TVLine announced the appearance of Hans in the third episode of this series' Season 4, and on July 28, actor Tyler Jacob Moore was announced to have been cast in this role. On the same day, John Rhys-Davies was cast as the voice of rock troll Pabbie. A first look at a Frozen scene from the show's fourth season was screened at the 2014 San Diego Comic-Con International, which depicted a story line taking place after the animated film's events. On August 13, 2014, it was announced that a one-hour special titled The Story of Frozen: Making a Disney Animated Classic would air September 2, 2014 on ABC. It featured interviews with some of the cast and the creative team of the film, footage from Norway that inspired the look of Frozen, announcements of what is next for the franchise, and a preview of Anna, Elsa, and Kristoff's appearance in Once Upon a Time. The special also included a sneak peek of Walt Disney Animation Studios' Big Hero 6. Frozen Fever is a short sequel that was released in early 2015. On September 2, 2014, during the ABC airing of The Story of Frozen: Making a Disney Animated Classic, Lasseter announced a Frozen short film with a new song will be released in the future. On the same day, Variety announced that the short would be released in spring 2015 under the title Frozen Fever, with Lee and Buck returning as directors, Del Vecho producing and a new song by Lopez and Anderson-Lopez. The short involves Elsa and Kristoff throwing a birthday party for Anna, but Elsa's icy powers put the party at risk. In a mid-October interview, Idina Menzel revealed that the cast had already recorded their vocal tracks: "We just worked on a short for Frozen." On December 3, 2014, it was announced that Aimee Scribner would be a co-producer and that Frozen Fever would debut in theaters with Disney's Cinderella on March 13, 2015. The short film was released on the Walt Disney Animation Studios Short Films Collection DVD/Blu-ray Combo Pack on August 18, 2015. It was also included on the Blu-ray, DVD, and digital HD releases of Cinderella on September 15, 2015. On February 9, 2016, it was announced that a Frozen holiday special was in development, scheduled to premiere in 2017 on ABC. It is directed by Kevin Deters and Stevie Wermers-Skelton (Prep & Landing, Prep & Landing: Operation: Secret Santa), and is produced by Roy Conli (Tangled, Big Hero 6). During the airing The Making of Frozen: Return to Arendelle on ABC in 2016, it was revealed that the name of the holiday special would be Olaf's Frozen Adventure. It was later revealed by John Lasseter in June 2017 that the 21-minute special would instead receive a limited time theatrical release. It premiered in theaters with Pixar's Coco on November 22, 2017, and made its television debut on ABC on December 14, 2017. The DVD and Blu-ray for the short film was released on November 13, 2018. The Frozen franchise contains many songs which have achieved a level of independent success outside the context of the films they were featured in. These include: "Frozen Heart", "Do You Want to Build a Snowman? ", "For the First Time in Forever", "Love Is an Open Door", "Let It Go", "Reindeer(s) Are Better Than People", "In Summer", and "Fixer Upper" (all featured in Frozen), and "Making Today a Perfect Day" (featured in Frozen Fever) and "Ring in the Season", "The Ballad of Flemmingrad", "That Time of Year" and "When We're Together" (all featured in Olaf's Frozen Adventure). The Frozen soundtrack was also very successful becoming the best-selling album of 2014 with over 10 million copies sold and "Let It Go", becoming the fifth best-selling single of 2014 . A radio program titled Frozen Radio is another format used to provide Frozen and other Disney songs to listeners. Additionally, a song titled "The Making of Frozen" was written as a featurette for the Blu-ray/DVD release of Frozen. With the success of the movie, Disney began work on three musicals adaptations, as an attraction at the Hyperion Theater in Disney California Adventure, for Broadway and Disney Cruise Line. On May 20, 2014, it was reported that Feld Entertainment's Disney on Ice was planning an ice skating show based on Frozen with assistance from the film's producers and directors, and that the show would start touring in September 2014 starting in Orlando, Florida, with a cast of 39. The show's world premiere was presented on September 4, 2014, at Orlando's Amway Center. Feld Entertainment disclosed in November that they had sold 250,000 tickets on the day they first became available and expected that over one million people would have seen the Frozen show by the end of 2014. The show includes a traditional "Ice Follies PinWheel" while still performing difficult ice skating jumps. All the popular songs from the movie are included. About Figure Skating Expert Jo Ann Schneider Farris gave it 5 stars. The first priority [for Disney Theatrical in 2016], I have to tell you, is when you have a property that is as beloved and music-based as "Frozen," that has to get an enormous amount of my attention. To say, How do we take this and make a sophisticated, adult evening of theater out of it? Because, as we know with our hits, they have been for that audience that includes the sophisticated theater-goer. On September 27, 2016 Disney announced the new creative team: Michael Grandage is the director and Christopher Oram is the scenic designer. Christopher Gattelli had been previously announced as choreographer. (Alex Timbers and Bob Crowley are no longer involved.) The musical opened on Broadway at the St. James Theatre. Frozen earned $400.7 million in North America, and an estimated $890 million in other countries, for a worldwide total of $1,276,480,335. Calculating in all expenses, Deadline Hollywood estimated that the film made a profit of over $400 million. It is the thirteenth-highest-grossing film (and was the fifth-highest at its peak), the highest-grossing animated film, the highest-grossing 2013 film, the highest-grossing Walt Disney Pictures release, and the fourth-highest-grossing film distributed by Disney. The film earned $110.6 million worldwide in its opening weekend. On March 2, 2014, its 101st day of release, it surpassed the $1 billion mark, becoming the eighteenth film in cinematic history, the seventh Disney-distributed film, the fifth non-sequel film, the second Disney-distributed film in 2013 (after Iron Man 3), and the first animated film since Toy Story 3 to do so. During the Walt Disney Company's 2014 first-quarter earnings conference call on February 5, 2014, Iger alluded to "high demand for Frozen merchandise", which was expanded upon by Disney senior executive vice president and chief financial officer Jay Rasulo: "Over the most recent quarter...if I had to pick out a single item, I would say Frozen items were the single most demanded items at Disney Stores. ":4,22 In March 2014, Bloomberg Businessweek reported that Disney had sold almost 500,000 Anna and Elsa dolls, with a 5,000 limited-edition run selling out online in only 45 minutes in January. Demand only increased further after the mid-March home video release; toy industry expert Jim Silver explained home video enabled children to "watch it over and over again" and "fall in love" with the film's characters. Chris Buck mentioned in an April 2014 interview that the directors had not bought anything for themselves "thinking it wouldn't be a problem, and now everything's sold out!" |By mid-April, U.S. consumer demand for Frozen merchandise was so high that resale prices for higher-quality limited-edition Frozen dolls and costumes had skyrocketed past $1,000 on eBay, both Disney and its licensees had arranged for air freight to rush fresh inventory to retailers besieged by desperate parents, and some of those parents had begun publicly venting their frustration through social media outlets such as the Disney Store's Facebook page. Needham & Co. analyst Sean McGowan compared the situation to the 1980s Cabbage Patch Kids craze, where "the demand is ... driven by the scarcity because of the social status attached to being able to find it." Fed up with the shortage, some parents took a "do it yourself" approach, and others went for custom-made replicas on crafts sites like Etsy. Similar shortages of Frozen merchandise were reported during spring 2014 in the United Kingdom, Canada, Australia, New Zealand, France, and Singapore. In a mid-April interview, Disney Store Vice President Jonathan Storey admitted that although Disney had high expectations for the film, "demand went even higher than they thought it ever would." He also promised that more Frozen merchandise would be delivered to Disney Store locations immediately through regular shipments, and that new products were being developed for release throughout the year. By the end of April, Disney Parks had imposed a five-item limit at its stores, while Disney Store had imposed a two-item limit, restricted the release of the most popular items to store opening on Saturday mornings, and required guests to enter into a lottery on those mornings just for the chance to purchase the very popular Elsa costumes. During The Walt Disney Company's 2014 second-quarter earnings call on May 6, 2014, Iger said Frozen "is definitely up there in terms of, probably, our top five franchises", and that the company will "take full advantage of that over the next at least five years." He also explained Disney was still working on the musical, as well as publishing, interactive, and theme park projects. Rasulo disclosed that nine of the ten best-selling items at Disney Store in the second quarter were Frozen-related. In response to demand from private art collectors for official Frozen-inspired fine art, the first batch of 10 artworks approved by Disney Fine Art went on sale in May 2014, at an art gallery in Sacramento, California. A few days earlier, on May 1, 2014, it had been reported that Disney Consumer Products was developing a comprehensive program of new Frozen merchandise for 2014 and 2015, which would include additional role play and plush items as well as "home décor, bath, textile, footwear", sporting goods, consumer electronics, and pool and summer toys (the last two to come in summer 2015). On June 25, 2014, DCP presented a "holiday fair" to journalists in New York City for the 2014 Christmas and holiday season, which included numerous Frozen-related items. MTV News warned parents to prepare to "'[l]et it go,' and by 'it' we mean 'your money.'" In early August, Fortune reported that Frozen could hit $1 billion in merchandise sales just in the U.S. market alone (that is, excluding sales of the actual film itself) by the end of 2014, with about half of that amount coming from toys. Advertising Age reported at the start of September that the Frozen brand would be expanding soon to even more kinds of products, such as backpacks, fruit, juice, yogurt, bandages, and oral care. In late September, film reviewer Kyle Smith of the New York Post wrote about how Disney had sent him an early DVD copy of Frozen almost a year earlier for him to review, and as a result had cost him approximately $900 in merchandise. He explained, "Frozen has turned my sweet daughters into mad merch-munching dragons who get all the hungrier the more we feed them." On October 9, 2014, Iger acknowledged at a conference on new media in San Francisco that demand for Frozen costumes "has been crazy since the movie came out, crazier than we ever anticipated, because, who knew?" He added that Disney was now "definitely prepared" to meet consumer demand. Around the same time, the National Retail Federation published a survey projecting that Frozen costumes would be the fourth most popular category of children's costumes for Halloween 2014, in that about 2.6 million American children were expected to dress up as Frozen characters. The Fresno Bee estimated that with all the accessories released for Halloween 2014, it would cost about $94 to fully costume a girl as Elsa. At the start of November, it was reported that the shortage of Frozen merchandise was finally over, and Disney and its licensees had "adapted to a new reality where demand for Frozen merchandise seems unquenchable." Disney announced that it had sold over three million Frozen costumes in North America alone, of which Elsa was the no. 1 best-selling Disney costume of all time, followed by Anna at no. 2. Walmart went into the 2014 Christmas and holiday season with about 700 distinct Frozen-related items of merchandise in stock. Among the Frozen-branded products made available in the U.S. market in late 2014 were duct tape and a version of Monopoly Junior marketed with the tagline, "Whoever collects the most cash will thaw their freezing heart and win". The "Frozen juggernaut" was cited as a major reason for a significant decline during 2014 in sales figures for other toy brands, including Hello Kitty and Barbie. The National Retail Federation's 2014 Holiday Top Toys Survey found that 20 percent of U.S. parents planned to buy Frozen-related merchandise for their girls, compared to only 16.8 percent who planned to buy Barbie merchandise. This meant Frozen toys were the No. 1 item on "holiday wish lists of girls", a position which Barbie had previously held for 11 years. The New York Times reporter Binyamin Appelbaum compared Disney's spectacular success with the Frozen merchandise brand to the pharmaceutical industry, in the sense that the actual consumer of the product is usually not the person who is stuck with the bill: "After all, who wants to say no to their princess?" NPD Group later estimated that Frozen merchandise had brought in $531 million in gross revenue during 2014, meaning that Frozen was the top toy brand of the year. On February 3, 2015, Disney Consumer Products reported a 22% rise in revenue and a 46% rise in operating income for the quarter ending on December 27, 2014 (as compared to the quarter a year earlier). The largest driver of that growth was Frozen merchandise. During the Walt Disney Company's earnings call on that same date, Frozen was mentioned 24 times, "more than 'Star Wars,' 'The Avengers,' 'Cinderella' and 'Spider-Man' combined." The next day, Disney's stock price jumped 8% in one day to close at a record high of $101.28 per share. The brand's success was only reinforced further on June 9, 2015, when Frozen won multiple awards at the LIMA International Licensing Awards ceremony in Las Vegas, including Overall Best Licensed Program and Film, Television, or Entertainment (Animated) Program. Jakks Pacific's Elsa toy won the award for Film, Television, or Entertainment (Animated) Licensee: Hard Goods (in a tie with Playmates Toys' Teenage Mutant Ninja Turtles), while Kohl's won the Retailer award for its presentation of Frozen products. 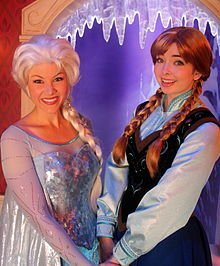 The meet-and-greets with Anna and Elsa at Disneyland and Epcot had been initially sponsored by The Walt Disney Studios as short-term temporary attractions starting from November 2013 to promote the film, but in February 2014, Disney Parks decided to extend them indefinitely in response to unprecedented demand. By the beginning of March, wait time was reportedly as long as four or five hours to see Anna and Elsa, which fueled outside speculation about whether Disney Parks would respond with additional Frozen-specific attractions. After wait times at Norway pavilion in Walt Disney World's Epcot reportedly reached six hours, in mid-April the Anna and Elsa meet-and-greets were finally moved to Princess Fairytale Hall at Magic Kingdom, where park guests could use the new FastPass+ reservation system (part of Disney's MyMagic+ project) to bypass the lengthy wait time. Jezebel.com commented on the phenomenon, "Word has it that those characters are like the Beatles now, attracting large crowds of screaming females." However, as of April 2014[update], there have not been any plans for Anna and Elsa to join the Disney Princess line-up, though Disney Store confirmed that it was still possible the characters would be added to that franchise in the future. When later asked about the situation with the meet-and-greets, Buck said, "Oh, it's crazy." He saw the four-hour-long line himself during a Disneyland visit in the summer of 2014, and tactfully declined a fellow visitor's suggestion to introduce himself to the huge crowd. In September 2014, a FastPass system was added to the Anna and Elsa meet-and-greet at Disneyland. In Christmas 2014, Hong Kong Disneyland opened a Frozen meet-and-greet in Fantasyland featuring Anna and Elsa. It requires a reservation ticket (similar to Disney Fastpasses) to meet them due to the high popularity of the film. There was also a puppet show about Olaf's search for summer in Fantasyland. Meet-and-greets with Anna and Elsa were introduced for the Christmas season in 2014 (mid-November 2014 to early January 2015) at Disneyland Paris in the Princess Pavilion. Reservation tickets were issued each morning for a limited number of slots. Due to queue lengths and poor guest behaviour, the meet-and-greets were discontinued in early 2015 and have only returned irregularly, and unannounced, in the Disneyland Hotel. After the film launched, Disneyland Paris decided to add a Frozen float into Disney Magic on Parade. In spring 2014, Walt Disney World's Magic Kingdom opened Disney Festival of Fantasy Parade, featuring Frozen characters on the first float. In May 2014, Mickey's Soundsational Parade in Disneyland debuted a Frozen pre-parade unit featuring Anna, Elsa, and Olaf. On January 28, 2015, it was announced that Disneyland would receive a new nighttime parade called "Paint the Night", which includes a Frozen float featuring Anna, Elsa, and Olaf. The parade premiered May 22 as part of Disneyland's 60th anniversary celebration. On March 26, 2017, Disney Stars on Parade premiered at Disneyland Paris. It features a Frozen unit with two floats. The first float includes Olaf riding on Sven and the second is a small castle with Anna and Elsa at the top. The second float features artificial snow. From November 15, 2013, to January 6, 2014, a full-length show titled World of Color: Winter Dreams debuted. Hosted by Olaf (Josh Gad) the show celebrates the winter season with several holiday-themed segments, featuring scenes from Frozen, Toy Story, Bambi, Fantasia, One Hundred and One Dalmatians, Prep & Landing, Secret of the Wings, Tangled, Wreck-It Ralph, Melody Time, Lady and the Tramp, Mickey's Once Upon a Christmas, Beauty and the Beast: The Enchanted Christmas, and various vintage Mickey Mouse shorts. The show incorporates traditional holiday-related music, including Eric Whitacre's "Glow", "Carol of the Bells", "Let it Snow", "It's the Most Wonderful Time of the Year", "I'll Be Home for Christmas", "Believe", "Silent Night", the "Nutcracker Suite", "Jingle Bells", "I Have a Little Dreidel", "Feliz Navidad", "Joy to the World", and "Have Yourself A Merry Little Christmas", as well as Frozen songs, such as "Let It Go" and "In Summer". In November 2014, World of Color: Winter Dreams opened with a different show than its pilot year. The pre-show segment of Glow has been removed, however its music plays after the post-show segment as exit music. Overall the show faced major rearrangement, such as additional songs from Frozen, including "Love Is an Open Door" and "Do You Want to Build a Snowman?". Additionally the isopar flames were introduced into this show during the "In Summer" sequence. On November 10, 2013 a full-length show titled Disney Dreams! of Christmas debuted. Hosted by Olaf, along with Anna from Frozen as co host. The show celebrates the winter season with several holiday-themed segments, featuring scenes which are almost the same as World Of Color Winter Dreams. In Christmas 2014, like World Of Color, the show opened with a different pilot. It features more scenes like World Of Color does, such as characters from Big Hero 6. On July 5, 2014, Disney's Hollywood Studios at Walt Disney World launched a "Frozen Summer Fun" program which was to run through September 1, and which included a daily parade, sing-along show, dance party, and fireworks show; an indoor ice skating rink and a merchandise shop; and Frozen décor throughout the theme park. In response to strong demand, Disney Parks subsequently announced on August 7 that Frozen Summer Fun would be extended to September 28. On December 5, 2014, the Disneyland Resort announced a "Frozen Fun" event at Disney California Adventure. While some of the attractions were made available starting on December 20, "Frozen Fun" officially began on January 7, 2015. The event included For the First Time in Forever: A Frozen Sing-Along Celebration at the Muppet*Vision 3D theater, "Olaf’s Snow Fest" (featuring a meet and greet with Olaf), Wandering Oaken’s Trading Post, "Freeze the Night! A Family Dance Party" (temporarily replacing Mad T Party), and "Anna and Elsa’s Royal Welcome", a meet-and-greet at the Disney Animation Building (replacing the meet-and-greet in Disneyland Park) as well as lessons on how to draw either Olaf or Marshmallow at the Animation Academy. In addition, Disneyland received a Frozen play at the Fantasy Faire, and an update to the Storybook Land Canal Boats to include the village of Arendelle from the film. On June 11, 2015, Hong Kong Disneyland launched a "Frozen Fun" event that runs through August 30. The major feature of the event is the "Frozen" Festival Show presented at the Crown Jewel Theatre inside Frozen Village, an area located in the “Black Box” space known as "The Pavilion", between Adventureland and Grizzly Gulch. Also inside Frozen Village is Frozen Festival Square where the meet-and-greet with Olaf, a toboggan ride, and Oaken’s Trading Post are located. Other attractions are "Frozen Processional", meet-and-greet with Anna and Elsa in Fantasyland as well as lessons on how to draw Olaf at the Animation Academy. On January 13, 2015, Tokyo Disneyland presented a winter event based on Frozen. This event featured a Frozen parade and special scenes on Once Upon A Time Castle projection show. The event ended on March 20, 2015. For the 2017 version of Anna and Elsa's Frozen Fantasy, a new projection mapping and firework show called Frozen Forever premiered. It was directed by Steve Davison. On January 22, 2015, it was announced that in the summer of 2015, Frozen themed activities will be added to select Disney Magic and Disney Wonder itineraries of the Disney Cruise Line. This includes a new Frozen-themed deck party, and, on the Magic, a new Frozen scene added to the Disney Dreams stage show. In addition, Anna, Elsa and other Frozen characters will be doing meet and greets on all the ships. This unconfirmed musical was in the early stages but is planned for the Wonder cruise ship, which is going in for refurbished in 2016. Sheryl Kaller is the director, while casting notices indicated Josh Prince as the choreographer. This musical has had one run-through and is expected to replace “Toy Story — The Musical” thus project as an hour long musical, shorter than the Broadway version. While considered the least extravagant, fake snow is included in the climactic scene. On August 19, 2014, it was initially announced that Elsa & Anna's Boutique (replacing Studio Disney 365) would open mid-September in Downtown Disney district at the Disneyland Resort. The opening date was later changed to October 6, 2014, and the store name was changed to "Anna & Elsa's Boutique". The location includes products inspired by Anna, Elsa, and Olaf. Anna & Elsa's Boutique promptly drew a line of curious consumers on its first day of operation, although Disney management was reportedly attempting to gauge consumer response before considering similar stores at other Disney locations. On September 12, 2014, Walt Disney World announced that a Frozen attraction is scheduled to open in June 2016 at Epcot's World Showcase in the Norway pavilion, replacing the park's Maelstrom ride. The attraction will feature the kingdom of Arendelle with music and scenes from the film, as well as meet-and-greets with Anna and Elsa. Buck and Lee confirmed in March 2015 that they have been assisting Disney Parks with the new Epcot ride's design. On the attraction, Buck stated "It's going to have real state-of-the-art audio animatoronics and it's going to look amazing." In June 2015, it was announced that the attraction's name will be "Frozen Ever After" and will feature the kingdom of Arendelle during its "Winter in Summer" event, which will include appearances by the Snowgies from Frozen Fever, in addition to Anna, Elsa, Kristoff, Sven, Olaf, and Marshmallow. The attraction opened on June 21, 2016. In September 2015, it was announced that Disney California Adventure would receive a Frozen-inspired musical stage show for the park's Hyperion Theater, titled Frozen – Live at the Hyperion. The show premiered on May 27, 2016 and is produced by Walt Disney Creative Entertainment. On April 28, 2015, the Oriental Land Company announced a new themed port at Tokyo DisneySea would be Scandinavia with a portion of the area being themed specifically to the world of Frozen. The new eighth themed port will be developed in the expansion site located south of Lost River Delta and has about the same size as Arabian Coast. On November 22, 2016, it was announced that the Hong Kong Disneyland Resort would get two major expansions. One of which was a Frozen themed area expansion. It is to feature two rides, meet-and-greets, entertainment, shops, and dining locations. It will be developed behind the current Fantasyland area and it is scheduled to open in 2020. It is said to be similar to the Tokyo Disney Resort Frozen themed area. The publisher Random House initially released five Frozen-related titles for English-speaking markets in conjunction with the film's release. By June 29, 2014, all five ranked among the Nielsen Top 20 bestselling books of 2014 in the U.S. market. By August, those five titles had collectively spent 148 weeks on USA Today's list of the top 150 bestselling books in the United States, and Random House had sold over 8 million Frozen-related books. That month, Random House announced a new series of four books by Erica David to be released in 2015; its first two installments, Anna & Elsa #1: All Hail the Queen and Anna & Elsa #2: Memory and Magic, which extends the plot beyond the events shown in the film as the sisters get to know each other, were released on January 6, 2015. They further plan to release three or four Frozen books a year in the future. In 2014, a Frozen-themed entry in Charles Solomon's "The Art of..." series was also released titled The Art of Frozen, depicting behind the scenes information regarding the film's production, and numerous conceptual artworks that informed the final visual style of the piece. A comic book adaption of Frozen titled Frozen – Graphic Novel was released digitally on July 23, 2014, by Disney Press, and a print version was published by Joe Books on January 27 of the following year. In January 2018, it was announced that a Frozen comic book series was set to be published by Dark Horse Comics. The series, titled Disney Frozen, will be written by Joe Caramagna with art from the Kawaii Creative Studio. It is set to launch in August 2018. In June 2016, Disney announced a franchise extension called Frozen Northern Lights. This brand extension including animated shorts, book series and a TV special, plus potential characterized toys courtesy of LEGO Friends. The extension's book series launched the extension on July 5, 2016 with its first book, Journey to the Lights, published by Random House by author Suzanne Francis and is 224 pages in length. The ten books in the series will be released by the end of 2017. The film's main characters attempt to restore the Northern Lights' glimmer and face Little Rock, the series' new protagonist. They later aired as a whole on December 9, 2016. Titled LEGO Frozen Northern Lights (also known as Frozen: Magic of the Northern Lights in the UK and Lego Frozen Northern Nights elsewhere), the shorts were compiled as a special and featured the returning voice talents of Kristen Bell, Idina Menzel, Jonathan Groff, and Josh Gad. The special received 2.01 million viewers and ranked fifth for the night on cable. ^ Lazaroff, Leon (November 7, 2014). "Disney's 'Frozen' Will Become the Biggest Franchise Ever". TheStreet.com. TheStreet, Inc. Archived from the original on February 15, 2015. Retrieved February 8, 2015. ^ Holden, Stephen (November 26, 2013). "Disney's 'Frozen,' a Makeover of 'The Snow Queen'". The New York Times. Archived from the original on January 6, 2017. Retrieved November 23, 2016. ^ a b c d e f Mandell, Andrea (June 21, 2016). "Disney announces a fresh 'Frozen' bonanza". USA Today. Archived from the original on September 2, 2016. Retrieved September 20, 2016. ^ a b Graser, Marc (March 12, 2015). "Disney Announces 'Frozen 2'". Variety. Archived from the original on March 12, 2015. Retrieved March 12, 2015. ^ a b c d e f Paulson, Michael; Barnes, Brooke (June 6, 2016). "Let It Go Go Go! Three Stage Versions of 'Frozen' Are on the Way". The New York Times. The New York Times Company. Archived from the original on June 15, 2016. Retrieved June 13, 2016. ^ a b Baran, Michelle (July 6, 2014). "Disney's 'Frozen' is sending tourists packing for Norway". Travel Weekly. Northstar Travel Media, LLC. Archived from the original on November 5, 2015. Retrieved July 20, 2014. ^ Morris, Jessica (June 20, 2014). "Disney's 'Frozen' fires up Norway's tourism". CNBC.com. CNBC LLC. Archived from the original on July 1, 2014. Retrieved July 20, 2014. ^ a b Lee, Hyo-Won (March 31, 2014). "'Frozen' Producer Talks Franchise Rumors, Disney Strategy, Bizarre Popularity in South Korea (Q&A)". The Hollywood Reporter. Archived from the original on April 3, 2014. Retrieved April 5, 2014. ^ Erlichman, Jon (April 22, 2014). "Frozen Is a 'Gigantic' Success" (Video). Bloomberg Television. 00:55: Bloomberg. Archived from the original on May 8, 2014. Retrieved April 22, 2014. ^ Rosen, Christopher (April 23, 2014). "'Frozen' Sequel Not In Development Just Yet". The Huffington Post. Archived from the original on April 28, 2014. Retrieved May 29, 2014. ^ a b Faber, David (May 7, 2014). "CNBC Exclusive: CNBC Transcript: Disney Chairman & CEO Bob Iger Speaks with CNBC's David Faber on "Squawk on the Street" Today". Squawk on the Street. CNBC. Archived from the original on May 8, 2014. Retrieved May 8, 2014. ^ Flores, Terry (June 10, 2014). "'Frozen's' Jennifer Lee Melts Glass Ceilings". Variety. Variety Media LLC. Archived from the original on July 15, 2014. Retrieved June 16, 2014. ^ a b Graser, Marc; Dave McNary (August 5, 2014). "'Frozen' Director Jennifer Lee to Adapt 'A Wrinkle in Time' for Disney". Variety. Archived from the original on August 9, 2014. Retrieved August 9, 2014. McLean, Craig (November 28, 2014). "The actress who is Frozen's Elsa". The Daily Telegraph. Telegraph Media Group Limited. Archived from the original on December 4, 2014. Retrieved December 7, 2014. Singh, Anita (November 28, 2014). "Frozen 2: the sequel is happening, says Idina Menzel". The Daily Telegraph. Telegraph Media Group Limited. Archived from the original on December 8, 2014. Retrieved December 7, 2014. ^ Gajewski, Ryan (November 30, 2014). "Idina Menzel: 'Frozen' Sequel Is Being Developed". The Hollywood Reporter. Archived from the original on December 4, 2014. Retrieved December 7, 2014. ^ Bloom, David (November 30, 2014). "'Frozen' Sequel "In The Works," Says Idina Menzel". Deadline Hollywood. Penske Business Media, LLC. Archived from the original on December 10, 2014. Retrieved December 7, 2014. ^ Hines, Ree (December 1, 2014). "Idina Menzel talks 'Frozen' sequel: 'I just assume' it's on the way". Today. Archived from the original on December 9, 2014. Retrieved December 7, 2014. ^ Dockterman, Eliana (December 1, 2014). "There May Not Be a Frozen Sequel After All". Time. Archived from the original on December 4, 2014. Retrieved December 7, 2014. ^ Gettell, Oliver (December 1, 2014). "Idina Menzel backtracks on 'Frozen' sequel comments". Los Angeles Times. Archived from the original on December 6, 2014. Retrieved December 7, 2014. ^ a b Wieselman, Jarett (March 6, 2015). "Why The Filmmakers Were Scared To Make More "Frozen"". BuzzFeed News. BuzzFeed, Inc. Archived from the original on March 8, 2015. Retrieved March 7, 2015. ^ Barker, Andrew (March 10, 2015). "Creative Impact Animation Honoree John Lasseter Grooms Top Directors". Variety. Archived from the original on April 2, 2015. Retrieved March 26, 2015. ^ a b c Walt Disney Company (March 12, 2015). "2015 Meeting of Shareholders" (Transcript). Walt Disney Company. p. 12. Archived (PDF) from the original on May 13, 2015. Retrieved June 14, 2015. ^ Miller, Daniel; Rebecca Keegan (March 13, 2015). "Disney announces big-screen 'Frozen 2'". Los Angeles Times. Tribune Publishing Company. Archived from the original on March 14, 2015. Retrieved March 14, 2015. ^ a b Quinn, Karl (April 26, 2015). "Frozen sequel: co-director Chris Buck chilled about audience expectations". Sydney Morning Herald. Fairfax Media. Archived from the original on April 28, 2015. Retrieved May 2, 2015. ^ Yoshinaga, Peta (April 30, 2015). "Creator of Frozen, animation director Chris Buck, admits working on sequel to the blockbuster is daunting". ABC News (Australia). Australian Broadcasting Corporation. Archived from the original on May 3, 2015. Retrieved May 2, 2015. ^ a b Kuesel, Christy (November 5, 2015). "Q&A: 'Frozen' producer talks Disney, sequels, and advice for aspiring filmmakers". The Chronicle. Duke Student Publishing Company. Archived from the original on November 17, 2015. Retrieved November 14, 2015. ^ a b Foutch, Haleigh (March 18, 2016). "'Frozen 2': Kristen Bell Says She's About to Head Back into the Recording Studio". Collider.com. Complex Media. Archived from the original on March 20, 2016. Retrieved March 19, 2016. ^ Trumbore, Dave (September 19, 2016). "Kristen Bell Shares Updates on 'Frozen 2' and the Olaf Christmas Special". Collider.com. Complex Media. Archived from the original on January 16, 2017. Retrieved January 13, 2017. ^ Khatchatourian, Maane (April 25, 2017). "Disney Dates 'Lion King,' 'Frozen 2,' Pushes Fifth 'Indiana Jones' Film to 2020". Variety. Archived from the original on April 25, 2017. Retrieved April 25, 2017. ^ Whitbrook, James (August 8, 2017). "Disney Is Planning to Pull All of Its Movies from Netflix and Start Its Own Streaming Service [Updated]". IO9. Retrieved August 16, 2018. ^ "'Frozen 2' Spoilers, Release Date: Director Teases New Songs, Characters and More Development Updates". Retrieved May 3, 2018. ^ a b "GameMill Publishing's "Disney Frozen: Olaf's Quest" is Available Today for Nintendo DS and Nintendo 3DS" (Press release). Gamasutra. November 19, 2013. Archived from the original on February 19, 2014. Retrieved January 29, 2014. ^ "GameMill Publishing Announces Video Game Companion to Walt Disney Animation Studios Film "Frozen" For Nintendo 3DS and Nintendo DS" (Press release). Gamasutra. October 1, 2013. Archived from the original on January 26, 2014. Retrieved January 29, 2014. ^ Prell, Sam (November 24, 2013). "Disney Infinity to add Wreck-It Ralph, Tangled, Frozen characters". Joysitq. Archived from the original on January 26, 2014. Retrieved January 29, 2014. ^ Tach, Dave (November 22, 2013). "Frozen, Rapunzel, Wreck-It Ralph hit Disney Infinity this holiday". Polygon. Archived from the original on February 22, 2014. Retrieved March 5, 2014. ^ "Disney Infinity Figure (Elsa) – PlayStation 3, Xbox 360, Nintendo Wii, Wii U, 3DS". Best Buy. Archived from the original on March 5, 2014. Retrieved March 5, 2014. ^ "Disney Infinity Figure (Anna) – PlayStation 3, Xbox 360, Nintendo Wii, Wii U, 3DS". Best Buy. Archived from the original on March 5, 2014. Retrieved March 5, 2014. ^ "Frozen Free Fall – Disney Games". Disney.com. Archived from the original on January 27, 2014. Retrieved February 1, 2014. ^ Berthelson, Talor (December 22, 2013). "Frozen Free Fall Walkthrough, Cheats and Strategy Guide". GameZebo. Archived from the original on February 28, 2014. Retrieved February 1, 2014. ^ "Frozen (2013): Games & Apps". Disney.co.uk. Disney. Archived from the original on February 22, 2014. Retrieved February 15, 2014. ^ King, Channing (July 11, 2014). "'Frozen'-themed PlayStation 4 hits next week...in Japan". IndyStar. Indianapolis Star. Archived from the original on November 5, 2015. Retrieved July 18, 2014. ^ "Frozen is now in Disney Club Penguin too". TechnologyTell. Archived from the original on February 4, 2015. ^ Perez, Daniel (September 15, 2015). "Frozen Free Fall: Snowball Fight available for free on PlayStation, Xbox, and Steam". Shacknews. Archived from the original on February 2, 2017. Retrieved January 26, 2017. ^ Lee, Julia (June 10, 2017). "New Kingdom Hearts 3 gameplay trailer shows Frozen world". Polygon. Retrieved June 10, 2017. ^ a b Ng, Philiana (May 12, 2014). "'Once Upon a Time' Bosses on 'Frozen' Reveal: We Want to Do It Justice (Q&A)". The Hollywood Reporter. Archived from the original on May 15, 2014. Retrieved May 14, 2014. ^ a b Rothman, Lily (May 12, 2014). "Was That Elsa from Frozen on Once Upon a Time?". Time. Archived from the original on May 14, 2014. Retrieved May 14, 2014. ^ "How the Producers of Once Upon a Time Kept That Frozen Shocker a Secret". Time. Archived from the original on May 12, 2014. Retrieved May 12, 2014. ^ a b Cooper, Gael Fashingbauer (June 9, 2014). "Anna and Kristoff from 'Frozen' will join Elsa on 'Once Upon a Time' TV series". Today.com. NBC News. Archived from the original on June 10, 2014. Retrieved June 9, 2014. ^ Santos, Kristin Dos (April 17, 2014). "Kristen Bell to Guest Star on Once Upon a Time?! Plus, Kristin Chenoweth Is on Board for Pushing Daisies Musical!". E! Online. E! Entertainment Television, LLC, NBC Universal. Archived from the original on June 16, 2014. Retrieved June 12, 2014. ^ Webb Mitovich, Matt (June 7, 2014). "Once Upon a Time Scoop: Which Other Frozen Characters Are Being Cast?". TVLine. TVLine Media, LLC. Archived from the original on June 8, 2014. Retrieved June 7, 2014. ^ Goldman, Eric (June 8, 2014). "Anna From Frozen Joining Elsa on Once Upon a Time". IGN. IGN Entertainment, Inc. Archived from the original on June 9, 2014. Retrieved June 8, 2014. ^ Hibberd, James (July 3, 2014). "'Once Upon a Time' scoop: Elsa from 'Frozen' cast". Entertainment Weekly. Entertainment Weekly Inc. Archived from the original on July 15, 2014. Retrieved July 23, 2014. ^ Idato, Michael (July 4, 2014). "Once Upon A Time to star Australian Georgina Haig as Frozen's Elsa". Sydney Morning Herald. Fairfax Media. Archived from the original on July 12, 2014. Retrieved July 10, 2014. ^ Webb Mitovich, Matt (June 22, 2014). "Once Upon a Time Casting Another Frozen Role — Who Should Fill It?". TVLine. TVLine Media, LLC. Archived from the original on July 25, 2014. Retrieved June 22, 2014. ^ Ng, Philiana (July 28, 2014). "'Once Upon a Time' Finds 'Frozen's' Prince Hans". The Hollywood Reporter. Archived from the original on July 29, 2014. Retrieved July 29, 2014. ^ Weinstein, Shelli (July 28, 2014). "John Rhys-Davies, Tyler Jacob Moore Join 'Once Upon a Time' for 'Frozen' Roles". Variety. Variety Media, LLC. Archived from the original on July 30, 2014. Retrieved July 29, 2014. ^ Ng, Philiana (July 26, 2014). "Comic-Con: 'Once Upon a Time' Reveals First 'Frozen' Clip". The Hollywood Reporter. Archived from the original on August 10, 2014. Retrieved July 29, 2014. ^ "Learn the Story of Frozen and Find Out What's Next for Anna and Elsa". Disney Insider. August 13, 2014. Archived from the original on August 14, 2014. Retrieved August 13, 2014. ^ Hibberd, James (August 13, 2014). "ABC to show how Disney made 'Frozen'". Entertainment Weekly. Archived from the original on August 14, 2014. Retrieved August 15, 2014. ^ Prudom, Laura (August 13, 2014). "ABC to Air 'The Story of Frozen' Behind-the-Scenes Special". Variety. Variety Media, LLC. Archived from the original on August 15, 2014. Retrieved August 15, 2014. ^ Butler, Karen (September 2, 2014). "'Frozen' characters to return for a new short film, says Disney". United Press International. United Press International, Inc. Archived from the original on September 3, 2014. Retrieved September 3, 2014. ^ Graser, Marc (September 2, 2014). "'Frozen' Characters to Return in 'Frozen Fever' Animated Short". Variety. Archived from the original on September 4, 2014. Retrieved September 2, 2014. ^ Zakarin, Jordan (September 2, 2014). "Disney's New 'Frozen' Short Film Will Premiere in Spring 2015". The Wrap. The Wrap News Inc. Archived from the original on September 3, 2014. Retrieved September 3, 2014. ^ Breznican, Anthony (September 2, 2014). "'Frozen Fever': Disney to bring back Elsa and Anna for animated short". Entertainment Weekly. Entertainment Weekly and Time Inc. Archived from the original on September 3, 2014. Retrieved September 3, 2014. ^ Feeney, Nolan (October 14, 2014). "Idina Menzel Doesn't Understand Why Her Christmas Album Is Out in October". Time. Time Inc. Archived from the original on October 14, 2014. Retrieved October 15, 2014. ^ Graser, Marc (December 3, 2014). "'Frozen Fever' Short to Debut in Front of Disney's 'Cinderella'". Variety. Archived from the original on December 9, 2014. Retrieved December 3, 2014. ^ Ford, Rebecca (December 3, 2014). "'Frozen' Short Film to Screen in Front of Disney's 'Cinderella'". The Hollywood Reporter. Archived from the original on December 3, 2014. Retrieved December 3, 2014. ^ Doty, Meriah (June 4, 2015). "'Frozen Fever' (and Easter Eggs!) Coming Soon on Disney Shorts Blu-ray (Exclusive)". Yahoo! Movies. Archived from the original on June 4, 2015. Retrieved June 4, 2015. ^ Evry, Max (June 12, 2015). "Cinderella Blu-ray and Digital HD Announced, Watch Alternate Opening". ComingSoon.net. Archived from the original on June 26, 2015. Retrieved July 5, 2015. ^ "ABC to Air FROZEN Holiday Special in 2017; Idina Menzel, Kristen Bell & Josh Gad to Return!". Broadway world. February 9, 2016. Archived from the original on February 11, 2016. Retrieved February 9, 2016. ^ Booth, Kaitlyn (June 13, 2017). "Olaf's Frozen Adventure Trailer For The 21-Minute Featurette In Front Of Coco". Bleeding Cool. Retrieved December 2, 2017. ^ a b c Schneider Farris, Jo Ann. "Review of Disney On Ice: Frozen". About.com Sports. About, Inc. Archived from the original on November 24, 2016. Retrieved November 23, 2016. ^ a b Barnes, Brooke (May 20, 2014). "'Frozen' Will Be a Disney on Ice Show, Too, Riding a Blockbuster's Wave". The New York Times. Archived from the original on May 20, 2014. Retrieved May 20, 2014. ^ Palm, Matthew (September 3, 2014). "'Disney on Ice presents Frozen' has world premiere in Orlando". Orlando Sentinel. Tribune Publishing Company. Archived from the original on September 7, 2014. Retrieved September 7, 2014. ^ Palm, Matthew (September 4, 2014). "Review: 'Disney on Ice presents Frozen' from Feld Entertainment". Orlando Sentinel. Tribune Publishing Company. Archived from the original on September 7, 2014. Retrieved September 7, 2014. ^ Palmeri, Christopher (November 17, 2014). "Disney's 'Frozen' Breaks Ticket Sale Record in Ice Show". Bloomberg Businessweek. Archived from the original on November 19, 2014. Retrieved November 19, 2014. ^ Lanz, Michelle (November 18, 2014). "Why it took Disney 18 years to bring 'Hunchback of Notre Dame' to the U.S. stage". Southern California Public Radio. Archived from the original on May 12, 2015. Retrieved April 26, 2015. ^ a b Reingold, Jennifer (January 13, 2014). "Disney CEO Iger: Frozen has restored our mojo". Fortune. Archived from the original on June 4, 2014. Retrieved January 13, 2014. ^ Cox, Gordon (January 13, 2014). "Disney Considering "Frozen" for Broadway, Obviously". Variety. Archived from the original on January 14, 2014. Retrieved January 13, 2014. ^ Rothman, Lily (February 24, 2014). "Ice, Ice, Baby: Frozen inspires a totally chilled-out cult following". Time. 183 (7): 48–59. Disney has already announced plans to bring a musical version to Broadway, and theme-park incarnations have been hinted at. ^ Emery, Debbie (January 13, 2014). "'Frozen' Musical Is Headed to Broadway". The Hollywood Reporter. Archived from the original on June 8, 2014. Retrieved May 28, 2014. ^ a b c The Walt Disney Company (February 5, 2014). "Transcript of the Walt Disney Company Q1 FY14 Earnings Conference Call" (PDF). Archived (PDF) from the original on April 4, 2014. Retrieved April 3, 2014. ^ Williams College (June 30, 2014). "Exploring the Songs of "Frozen" with Kristen Anderson-Lopez '94". YouTube. Williams College. Archived from the original on November 5, 2015. Retrieved August 10, 2014. ^ a b c Rooney, David (October 16, 2014). "Disney's Top Theater Exec on 'Frozen' Musical Plans: "I'm Talking to Directors". The Hollywood Reporter. Prometheus Global Media LLC. Archived from the original on October 18, 2014. Retrieved October 17, 2014. ^ "Cinderella's Lily James back with Richard Madden in Kenneth Branagh's Romeo and Juliet". Daily Mail. Associated Newspapers Ltd. February 12, 2015. Archived from the original on February 15, 2015. ^ Lee, Ashley (February 13, 2015). "'Frozen' Stage Musical Recruits Film's Co-Director, Songwriting Duo". The Hollywood Reporter. Prometheus Global Media. Archived from the original on February 16, 2015. Retrieved February 16, 2015. ^ Fung, Lisa (July 23, 2015). "Fresh Off 'Frozen,' Bobby Lopez and Kristen Anderson-Lopez Prepare a New Musical". The New York Times. Archived from the original on July 26, 2015. Retrieved July 26, 2015. ^ a b Cox, Gordon (February 9, 2016). "'Frozen' Musical Sets Broadway Timeline, Creative Team". Variety. Archived from the original on February 13, 2016. Retrieved February 9, 2016. ^ Crowley, Joanne (February 11, 2016). "Pre-Broadway version of Disney's "Frozen" coming to Denver". The Denver Post. Digital First Media. Archived from the original on February 14, 2016. Retrieved February 16, 2016. ^ Viagas, Robert (April 21, 2016). "Coronation Day! Disney's Frozen Stage Musical Picks Its Elsa". Playbill. Archived from the original on April 21, 2016. Retrieved April 21, 2016. ^ a b c d Clement, Olivia (April 26, 2016). "Exclusive: Frozen Songwriters Announce Stage Musical Will Have Over 20 Songs". Playbill. Archived from the original on May 16, 2016. Retrieved May 11, 2016. ^ Palmeri, Christopher; Sakoui, Anousha (March 14, 2014). "Disney's 'Frozen' Passing $1 Billion Cements Rebound". Bloomberg Businessweek. Archived from the original on July 6, 2014. Retrieved April 6, 2014. ^ a b Nania, Rachel (April 17, 2014). "A 'Frozen' retail supply angers parents, saddens kids". WTOP 103.5 FM. Archived from the original on April 21, 2014. Retrieved April 20, 2014. ^ Brew, Simon (April 4, 2014). "Jennifer Lee & Chris Buck interview: Frozen, Statham, Frozen 2". Den of Geek!. Dennis Publishing. Archived from the original on April 7, 2014. Retrieved April 6, 2014. ^ a b Berr, Jonathan (April 11, 2014). "Want to buy "Frozen" merchandise? Be prepared to wait or pay up". CBS MoneyWatch. CBS Interactive Inc. Archived from the original on April 13, 2014. Retrieved April 13, 2014. ^ a b Liddane, Lisa (April 10, 2014). "Most-wanted dress in the U.S.: 'Frozen's' Elsa frock". Orange County Register. Archived from the original on April 13, 2014. Retrieved April 13, 2014. ^ Kavilanz, Parija (April 10, 2014). "'Frozen' Elsa dress selling for $1,000 on eBay". CNNMoney. Archived from the original on April 12, 2014. Retrieved April 11, 2014. ^ a b Palmeri, Christopher (April 17, 2014). "Elsa's Frozen Dress: The Hottest Gown in Town". Bloomberg Businessweek. Archived from the original on April 21, 2014. Retrieved April 21, 2014. ^ Schuster, Dana (April 14, 2014). "'Frozen' merch is making parents do crazy things". New York Post. Archived from the original on April 16, 2014. Retrieved April 16, 2014. ^ Vincent, Alice (April 10, 2014). "Frozen merchandise shortage spells trouble for parents". The Daily Telegraph. London. Archived from the original on April 13, 2014. Retrieved April 13, 2014. ^ Wood, Zoe (May 17, 2014). "Frozen: parental panic as unexpected Disney hit leads to merchandise sellout". The Guardian. Archived from the original on May 18, 2014. Retrieved May 18, 2014. ^ March, Catherine Dawson (April 17, 2014). "Frozen-out in the toy aisle: Why merch for Disney's hit film is in short supply". The Globe and Mail. Toronto. Archived from the original on April 21, 2014. Retrieved April 20, 2014. ^ Mayoh, Lisa (May 24, 2014). "Australian supplies of Frozen dolls have dried up". The Daily Telegraph. Sydney. Archived from the original on May 24, 2014. Retrieved May 29, 2014. ^ Han, Esther (July 4, 2014). "S'no joke for parents as stocks of Frozen movie merchandise sell out". Sydney Morning Herald. Fairfax Media. Archived from the original on June 27, 2014. Retrieved July 10, 2014. ^ Kenny, Katie (May 16, 2014). "Do you want to buy a snowman?". Stuff.co.nz. Fairfax New Zealand Limited. Retrieved May 17, 2014. ^ Quennesson, Perrine (April 24, 2014). "La Reine des Neiges : un succès qui rend fou". Premiere (in French). Lagardère Group. Archived from the original on April 26, 2014. Retrieved April 26, 2014. ^ Ang, Benson (April 20, 2014). "'Frozen' dress sold out in Singapore". The Straits Times. Archived from the original on April 21, 2014. Retrieved April 22, 2014. ^ a b c Brigante, Ricky (April 22, 2014). "Disney Store promises more "Frozen" merchandise, mall experience to continue kid focus sending adults online". Inside the Magic. Distant Creations Group, LLC. Archived from the original on April 23, 2014. Retrieved April 22, 2014. ^ Thurston, Susan (May 21, 2014). "'Frozen' frenzy creates shortage for Elsa, Anna merchandise". Tampa Bay Times. Archived from the original on May 29, 2014. Retrieved May 29, 2014. ^ Zakarin, Jordan (May 2, 2014). "America's 'Frozen' Obsession Continues, Leading to Disney Store Lotteries and Disneyland Craziness". The Wrap. The Wrap News Inc. Archived from the original on May 4, 2014. Retrieved May 5, 2014. ^ a b c Fritz, Ben (May 6, 2014). "Disney's Film Business Gets Big Boost From 'Frozen': Operating Income at Film Unit More Than Quadruples; Musical in the Works". Wall Street Journal. Archived from the original on December 15, 2014. Retrieved May 8, 2014. ^ Anderson, Cathie (May 8, 2014). "Sacramento store to debut art inspired by 'Frozen'". The Sacramento Bee. The McClatchy Company. Archived from the original on July 14, 2014. Retrieved July 13, 2014. ^ Anonymous (May 1, 2014). "Frozen Warms Up Audiences, Consumers and Retailers". License! Global. Advanstar Communications Inc. Archived from the original on July 15, 2014. Retrieved July 13, 2014. ^ a b Zalben, Alex (June 25, 2014). "Here's Every 'Frozen' Gift You're Going To Be Forced To Buy This Christmas". MTV News. Viacom International Inc. Archived from the original on July 14, 2014. Retrieved July 20, 2014. ^ Kell, John. "What'll be hot for the holiday toy season? Disney's Frozen". Fortune (August 2, 2014). Time Inc. Archived from the original on August 2, 2014. Retrieved August 2, 2014. ^ Bulik, Beth Snyder (September 3, 2014). "How Disney Has Managed to Keep 'Frozen' Red Hot". Advertising Age. Crain Communications. Archived from the original on February 15, 2015. Retrieved October 7, 2014. ^ a b Smith, Kyle (September 24, 2014). "How Disney's 'Frozen' ruined my life". New York Post. NYP Holdings, Inc. Archived from the original on October 2, 2014. Retrieved October 5, 2014. ^ a b Palmeri, Christopher (October 9, 2014). "Disney CEO Says Shanghai Park to Fare Better Than Paris". Bloomberg. Bloomberg L.P. Archived from the original on October 12, 2014. Retrieved October 13, 2014. ^ a b Clough, Bethany (October 11, 2014). "Retail Therapy: Time for Halloween make-believe". Fresno Bee. The McClatchy Company. Archived from the original on October 14, 2014. Retrieved October 13, 2014. ^ Thompson, Andrew (November 1, 2014). "Chillax parents, the great 'Frozen' toy shortage has thawed". Today.com. NBCUniversal Media. Archived from the original on November 1, 2014. Retrieved November 1, 2014. ^ a b Byron, Ellen; Paul Ziobro (November 4, 2014). "Elsa Dominates Anna in 'Frozen' Merchandise Sales". The Wall Street Journal. Dow Jones & Company. Archived from the original on December 15, 2014. Retrieved November 9, 2014. ^ Stangland, Sean (December 5, 2014). "Are you still infected with 'Frozen' fever?". Chicago Daily Herald. Paddock Publications, Inc. Archived from the original on January 3, 2015. Retrieved December 7, 2014. ^ Prang, Allison (February 18, 2015). "Monopoly Game Keeps Growing at Age 80, With Help From 'Frozen'". Bloomberg Business. Archived from the original on April 2, 2015. Retrieved March 26, 2015. ^ Einhorn, Bruce (October 31, 2014). "Hello Kitty, a Victim of Disney's Frozen Juggernaut". Bloomberg Business. Archived from the original on October 31, 2014. Retrieved November 1, 2014. ^ Kell, John (October 16, 2014). "Mattel's Barbie out of fashion with today's girls". Fortune. Time Inc. Archived from the original on November 2, 2014. Retrieved November 1, 2014. ^ "Elsa Dethrones Barbie As 'Frozen' Everything Takes The Top Holiday Toy Spot". The Huffington Post. November 26, 2014. Archived from the original on November 26, 2014. Retrieved November 27, 2014. ^ Appelbaum, Binyamin (November 18, 2014). "How Disney Turned 'Frozen' Into a Cash Cow". The New York Times. Archived from the original on November 18, 2014. Retrieved November 19, 2014. ^ Suddath, Claire (December 17, 2015). "The $500 Million Battle Over Disney's Princesses". Bloomberg BusinessWeek. New York: Bloomberg, L.P. Archived from the original on February 8, 2017. Retrieved February 14, 2017. ^ a b Fritz, Ben (February 3, 2015). "'Frozen' Performs for Disney". The Wall Street Journal. Dow Jones & Company. Archived from the original on February 8, 2015. Retrieved February 8, 2015. ^ Booton, Jennifer (February 4, 2015). "Disney praises 'Frozen' on earnings call – 24 times". MarketWatch. Archived from the original on February 7, 2015. Retrieved February 8, 2015. ^ Palmeri, Christopher (February 4, 2015). "Disney Shares Surge to All-Time High on 'Frozen' Earnings". Bloomberg Business. Archived from the original on February 11, 2015. Retrieved February 8, 2015. ^ a b Loveday, Samantha (June 10, 2015). "VEGAS 2015: Frozen triumphs at LIMA International Licensing Awards". Licensing.biz. NewBay Media Ltd. Archived from the original on June 23, 2015. Retrieved June 14, 2015. ^ Tully, Sarah (February 20, 2014). ""Frozen" characters draw unprecedented lines at Disneyland". Orange County Register. Archived from the original on March 3, 2014. Retrieved March 10, 2014. ^ Bevil, Dewayne (March 1, 2014). "Could Disney's 'Frozen' play bigger role in theme parks?". Orlando Sentinel. Archived from the original on April 7, 2014. Retrieved April 6, 2014. ^ Ryan, Joal (April 25, 2014). "Frozen Out: One Reporter's Tortured Quest to Meet Disneyland's Anna and Elsa". Yahoo! Movies. Yahoo!. Archived from the original on April 26, 2014. Retrieved April 27, 2014. ^ Brigante, Ricky (April 20, 2014). ""Frozen" characters find new home at Walt Disney World as FastPass+ cuts wait to meet Anna and Elsa – when it works". Inside the Magic. Archived from the original on April 23, 2014. Retrieved April 21, 2014. ^ Fickley-Baker, Jennifer (April 20, 2014). "'Frozen' Anna & Elsa Arrive at Princess Fairytale Hall Today". Disney Parks Blog. Archived from the original on April 22, 2014. Retrieved April 21, 2014. ^ a b c d Taylor, Drew (March 11, 2015). "'Frozen Fever' Is a 'Thank You' to Fans, Say Directors Jennifer Lee and Chris Buck". Moviefone. Whalerock Industries. Archived from the original on March 13, 2015. Retrieved March 14, 2015. ^ "Disneyland Frozen Meet and Greet Adds FastPass Reduces Line to 10 Minutes". Disney Dose. September 3, 2014. Archived from the original on September 4, 2014. Retrieved September 3, 2014. ^ "Prepare to be Wowed by Disneyland's Three New Nighttime Spectaculars". Disney Insider. April 14, 2015. Archived from the original on April 17, 2015. Retrieved April 14, 2015. ^ Max (February 5, 2017). "Disneyland Paris – Disney Stars On Parade Concept Art". MiceChat. Archived from the original on February 11, 2017. Retrieved February 12, 2017. ^ "Disneyland Resort Debuts 'World of Color – Winter Dreams,' a Merry New Spectacular for 2013 Holiday Season". PR Newswire. July 27, 2013. Archived from the original on August 7, 2013. Retrieved July 27, 2013. ^ Glover, Erin (September 24, 2013). "end Your Voice to 'World of Color – Winter Dreams' at Disney California Adventure Park". The Walt Disney Company. The Disney Parks Blog. Archived from the original on November 26, 2013. Retrieved November 18, 2013. ^ Brigante, Ricky (July 5, 2014). "Frozen Summer Fun event debuts at Walt Disney World as Anna, Elsa, Kristoff, and Olaf appear in delightful new shows". Inside the Magic. Distant Creations Group, LLC. Archived from the original on July 8, 2014. Retrieved July 10, 2014. ^ Wynne, Sharon Kennedy (August 7, 2014). "'Frozen' still hot at Disney theme park, celebration extended". Tampa Bay Times. Archived from the original on August 11, 2014. Retrieved August 7, 2014. ^ Slater, Shawn (December 5, 2014). "New 'Frozen Fun' Opens at Disneyland Resort January 7". Disney Parks Blog. Walt Disney Parks and Resorts. Archived from the original on December 11, 2014. Retrieved December 5, 2014. ^ Graser, Marc (December 5, 2014). "Disney Adds 'Frozen' Experiences to Disneyland, California Adventure Theme Parks". Variety. Archived from the original on December 9, 2014. Retrieved December 5, 2014. ^ Frontado, Jonathan (January 22, 2015). "Land of 'Frozen' Coming to Disney Cruise Line This Summer". Disney Parks Blog. Walt Disney Parks and Resorts. Archived from the original on January 23, 2015. Retrieved January 23, 2015. ^ Harker, Michelle (August 19, 2014). "Elsa & Anna's Boutique and More Thrilling Transformations Coming to the Disneyland Resort". Disney Parks Blog. Archived from the original on August 20, 2014. Retrieved August 19, 2014. ^ "Studio Disney 365 to Transform into Elsa and Anna's Boutique". LaughingPlace.com. August 19, 2014. Archived from the original on August 21, 2014. Retrieved August 19, 2014. ^ Harker, Michelle (September 16, 2014). "Update: Anna & Elsa's Boutique in the Downtown Disney District at the Disneyland Resort". Disney Parks Blog. Archived from the original on September 19, 2014. Retrieved September 16, 2014. ^ "Anna & Elsa's Boutique to Open October 6". LaughingPlace.com. September 16, 2014. Archived from the original on November 4, 2015. Retrieved September 16, 2014. ^ Liddane, Lisa (October 6, 2014). "New store unleashes a 'Frozen' frenzy". Orange County Register. Freedom Communications, Inc. Archived from the original on October 10, 2014. Retrieved October 7, 2014. ^ Staggs, Tom (September 12, 2014). "'Frozen' Attraction Coming to Epcot". Disney Parks Blog. Archived from the original on September 13, 2014. Retrieved September 12, 2014. ^ Bilbao, Richard (September 12, 2014). "Disney replacing Epcot's Maelstrom with Frozen ride". Orlando Business Journal. Archived from the original on September 13, 2014. Retrieved September 12, 2014. ^ Brigante, Ricky (September 12, 2014). ""Frozen" ride announced for Walt Disney World in 2016 to replace Maelstrom at Epcot, "Frozen" Christmas also revealed". Inside the Magic. Archived from the original on September 14, 2014. Retrieved September 14, 2014. ^ Riley, James (June 9, 2015). "First look: Frozen Ever After is coming to Disney World's Epcot". USA Today. Retrieved June 9, 2015. ^ Fickley-Baker, Jennifer (May 20, 2016). "Frozen Ever After Attraction & Royal Sommerhus Set to Open at Epcot June 21". Disney Parks Blog. Archived from the original on May 21, 2016. Retrieved May 20, 2016. ^ "New Stage Musical Based on 'Frozen' Opens at Disney California Adventure". NBC Los Angeles. NBCUniversal Media, LLC. City News Service. May 27, 2016. Archived from the original on October 9, 2016. Retrieved October 7, 2016. ^ "Hong Kong Disneyland Announces Plan for Multi-Year Expansion With New Attractions and Entertainment". The Walt Disney Company. November 22, 2016. Archived from the original on February 12, 2017. Retrieved February 12, 2017. ^ Swanson, Clare (July 4, 2014). "The Bestselling Books of 2014 (So Far)". Publishers Weekly. Archived from the original on August 12, 2014. Retrieved August 10, 2014. ^ Castagna, Rebecca (August 7, 2014). "Book Buzz exclusive: Excerpt from new 'Frozen' series". USA Today. Retrieved August 10, 2014. ^ Legaspi, Althea (August 9, 2014). "Anna And Elsa Of 'Frozen' Are Coming To A Bookstore Near You". MTV News. Viacom International Inc. Archived from the original on August 10, 2014. Retrieved August 10, 2014. ^ Castagna, Rebecca (August 7, 2014). "Book Buzz exclusive: Excerpt from new 'Frozen' series". USA Today. Retrieved August 19, 2014. ^ Ayers, Mike (August 8, 2014). "'Frozen' Is Getting New Life as a Book Series". The Wall Street Journal. Dow Jones & Company, Inc. Archived from the original on August 24, 2014. Retrieved August 19, 2014. ^ Alexander, Ella (August 10, 2014). "Frozen sequel to come in the form of book series". The Independent. Independent Digital News and Media Ltd. Archived from the original on August 10, 2014. Retrieved August 10, 2014. ^ Earp, Catherine (August 9, 2014). "Disney's Frozen to get sequel as book series". Digital Spy. Archived from the original on August 14, 2014. Retrieved August 19, 2014. ^ "Book Review: The Art of Frozen". Animation World Network. Archived from the original on April 13, 2015. ^ "Disney Frozen Graphic Novel". voilaonline.com. Archived from the original on April 13, 2015. ^ McMillan, Graeme (January 29, 2018). "'Frozen' Comic Coming as Part of Disney Line From Dark Horse". The Hollywood Reporter. ^ "LEGO Disney Frozen Northern Lights (Part 1/4): Race to Lookout Mountain". December 10, 2016. Archived from the original on January 13, 2017. ^ "LEGO Disney Frozen Northern Lights (Part 2/4): Out of the Storm". December 11, 2016. Archived from the original on January 13, 2017. ^ "LEGO Disney Frozen Northern Lights (Part 3/4): The Great Glacier". December 12, 2016. Archived from the original on December 28, 2016. ^ "Frozen: Northern Lights". RadioTimes. Archived from the original on February 12, 2017. Retrieved February 12, 2017. ^ Layton, Jill (June 21, 2016). "We need a "Frozen" LEGO movie stat after seeing this new image". HelloGiggles. Archived from the original on December 13, 2016. A brand new Frozen story titled Frozen Northern Nights: Journey to the Lights is coming! ^ "Lego Frozen Northern Nights". zap2it. Archived from the original on December 13, 2016. ^ "The LEGO Disney Frozen Northern Lights Trailer is Here!". Disney Blogs. Archived from the original on November 22, 2016. ^ "SHOWBUZZDAILY's Top 150 Friday Cable Originals & Network Finals: 12.9.2016". Showbuzz Daily. Archived from the original on December 20, 2016. This page was last edited on 9 April 2019, at 03:45 (UTC).